At the start of the First World War, Louis Renault invested in the manufacture of shells, aircraft engines and other war materials. This was the reason why he refused General Estienne's request for the design of a tank on several occasions. However, he finally gave in and a first meeting between Louis Renault and Jean Baptiste Estienne took place on 1 August 1916. Renault offered him 11 tank designs. Estienne decided on the last, that of a light tank crewed by two men, which could be made using a maximum of mass-produced parts, enabling quicker and less expensive manufacture. 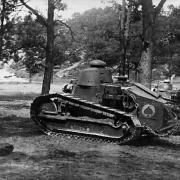 From this date on, there was a close and fruitful collaboration between Louis Renault and Estienne, culminating in the design of the FT 17 tank after a number of detours. A first prototype was delivered three months later. Estienne wrote: "I think it is possible to quickly manufacture a very light tank with caterpillar track, meeting the following conditions: Maximum weight: 4 tons. Maximum height: 1.75 m. Armour suitable for withstanding the latest armour-piercing bullets at 30 m. Armament: one machine gun or 37 mm canon, mounted in a fully rotating turret."